A list of hierarchy names separated by comma (,). These will be the hierarchies in the columns of the data source. The name of the cube in the data source. Additional properties sent with every discover request. The object is treated as a key/value store where each property name is used as the key and the property value as the value. Enables/disables caching of the XMLA result object. Additional properties sent with every execute request. A list of hierarchy names separated by comma (,). These will be hierarchies in the filters of the data source. Optional="true" a value indicating whether a members' set expressions on COLUMNS axis should be wrapped with AddCalculatedMembers MDX method. Default value is true. Optional="true" a value indicating whether a members' set expressions on ROWS axis should be wrapped with AddCalculatedMembers MDX method. Default value is true. Optional="true" a string array with the names of intrinsic non-context sensitive member properties applied on COLUMNS axis. By defult CHILDREN_CARDINALITY and PARENT_UNIQUE_NAME properties are always added to DIMENSION PROPERTIES. Optional="true" a string array with the names of intrinsic non-context sensitive member properties applied on ROWS axis. By defult CHILDREN_CARDINALITY and PARENT_UNIQUE_NAME properties are always added to DIMENSION PROPERTIES. Optional="true" a value indicating whether a NON EMPTY clause is present on COLUMNS axis. Default value is true. Optional="true" a value indicating whether a NON EMPTY clause is present on ROWS axis. Default value is true. The name of the measure group in the data source. A list of measure names separated by comma (,). These will be the measures of the data source. An object containing information about how the request to the XMLA server should be processed. A callback to be invoked right before the request is send to the server. Extends beforeSend callback of jQuery.ajax's options object. The value is applied to XmlHttpRequest.withCredentials if supported by the user agent. and will prompt the user for credentials. A list of hierarchy names separated by comma (,). These will be the hierarchies in the rows of the data source. Optional="false" The URL of the XMLA server. Adds a hierarchy to the columns of the pivot grid. An object of type $.ig.Hierarchy which is the hierarchy to add in the pivot grid columns. Adds a hierarchy to the filter axis of the pivot grid. An object of type $.ig.Hierarchy which is the hierarchy to add. Adds a measure to the measures of the pivot grid. An object of type $.ig.Measure which is the measure to add. Adds a hierarchy to the rows of the pivot grid. An object of type $.ig.Hierarchy which is the hierarchy to add in the pivot grid rows. An object of type $.ig.Catalog which is the currect catalog. Retrieves the current catalog in the data source. An array of $.ig.Catalog objects. Retrieves the currently loaded catalogs in the data source. Clears all pending changes since last time the update() method is called. Sets a tuple member to be collapsed next time the update() method is called. Calling this method on an already collapsed member does nothing. The name of the axis for the tuple. The index of the tuple in the axis. The index of the member in the tuple. An array of objects of type $.ig.Hierarchy or $.ig.MeasureList. Returns the items in the column axis. An object of type $.ig.Cube which is the currect cube. Retrieves the current cube in the data source. A array of $.ig.Cube objects. Retrieves the currently loaded cubes in the data source. Sets a tuple member to be expanded next time the update() method is called. Calling this method on an already expanded member does nothing. An array of objects of type $.ig.Hierarchy. Returns the items in the filter axis. A $.ig.ICoreOlapElement of specified type or null. Gets the first element of the specified elementType which matches the specified predicate or null if there is no such element found. A predicate callback invoked against each core element of the specified type. It has to return true when the element has matched the serach criteria, otherwise - false. An object specified by $.ig.ICoreOlapElement.prototype.$type property. Valid types which prototype can be examined are: $.ig.Dimension, $.ig.Hierarchy, $.ig.Level, $.ig.Measure and $.ig.MeasureList. An array of $.ig.ICoreOlapElement objects of specified type or empty array. Gets an array with elements of the specified elementType which match the specified predicate or empty array if there is no such element found. A $.ig.Dimension object or null. Returns $.ig.Dimension object for the specified unique name. The unique name of the searched dimension object. An array of string objects. Returns an array of strings with the unique names of selected for given hierarchy filter members. The unique name of the hierarchy whose active filter members are returned. A $.ig.Hierarchy object or null. Returns $.ig.Hierarchy object for the specified unique name. The unique name of the searched hierarchy object. A $.ig.Level object or null. Returns $.ig.Level object for the specified unique name. The unique name of the searched level object. A $.ig.Measure object or null. Returns $.ig.Measure object for the specified unique name. The unique name of the searched measure object. A $.ig.MeasureList object or null. Returns $.ig.MeasureList object available when operates with more than one $.ig.Measure object. Initializes the data source and returns a promise that will be resolved once the data source is initialized. The promise's result will be the metadata tree for the catalog/cube/measureGroup specified in the settings or null if the settings do not provide a valid cube initialization data. The data source is not functional until it has been initialized and all other methods other than initialize() will throw an error if isInitialized() returns false. True if the data source has been initialized, otherwise - false. Retrieves the initialization state of the data source. True if the data source has been modified since last time update() methos is called, otherwise false. Indicates whether the data source is modified. True if the update() method execution is in progress, otherwise false. Indicates whether the update() method execution is in progress. An object of type $.ig.MeasureGroup which is the currect measure group. Retrieves the current measureGroup in the data source. An array of $.ig.MeasureGroup objects. Retrieves the currently loaded measure groups in the data source. An array of objects of type $.ig.Measure. Returns the items in the measures axis. An object of type $.ig.OlapMetadataTreeItem which is the root node of the metadata tree. Returns the fully loaded metadata tree. Removes a hierarchy or the measure list from the columns of the pivot grid. An object of type $.ig.Hierarchy or $.ig.MeasureList which is the hierarchy to remove or the measure list if there are more than one measures added and the measure list location is set to "columns". Removes a hierarchy from the filter axis of the pivot grid. An object of type $.ig.Hierarchy which is the hierarchy to remove. Removes a measure from the measures of the pivot grid. An object of type $.ig.Measure which is the measure to remove. Removes a hierarchy or the measure list from the rows of the pivot grid. An object of type $.ig.Hierarchy or $.ig.MeasureList which is the hierarchy to remove or the measure list if there are more than one measures added and the measure list location is set to "rows". An object of type $.ig.OlapResult which represents the result returned by XMLA service. Returns the result from the last update or null if the last update was unsuccessful. Returns the items in the row axis. 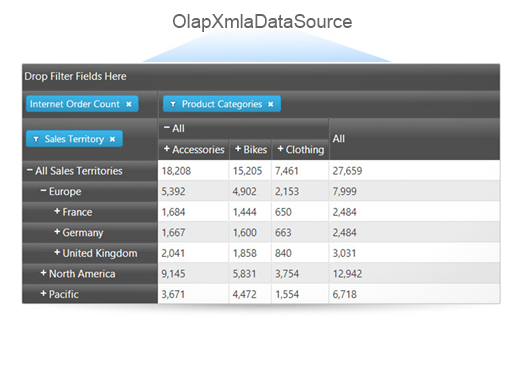 Sets the current catalog for the data source and updates the cubes() and catalog() properties. The name of the catalog. Sets the current cube for the data source and updates the cube(), measureGroup() and metadataTree() properties. Sets the current measure group for the data source and updates the measureGroup() and metadataTree() properties. Even though the catalogs/cubes/measureGroups items are cascading(e.g. in order to load the cubes a catalog has to be set) in order to construct the metadata tree a measure group is not required as it just filters the resulting metadata. Once setCube(cubeName) is called the metadata tree would be loaded and the measureGroup() property would be filled with the default '(All)' measure group which indicates that no measure group is selected. The name of the measure group. Sets the index at which the measure list will be positioned in the rows/columns it resides. The index where measure list to appear. Sets the location of the measure list. Accepted values are 'rows' and 'columns'. Performs an update with the list of pending changes and updates the data source result.